Wonderful class!! 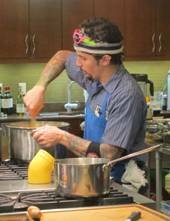 Great tips from Chef Richie – especially the salt and sugar brine for blanching. Tampa Bay is lucky to have Rolling Pin to bring us such accomplished chefs. This has been an evening of learning, fun, and pure enjoyment. I’m looking forward to experimenting with his recipes, especially the Cuban Cigar. Thank you for this wonderful evening. Richie is clearly a man of culinary skill. I am at awe at his ease of every task he taught us! Can’t wait to make the Cuban Cigar for my son and his buddies. First and best class! Chef Richie has an amazing art to food and the way he sees it. The Rolling Pin staff was very helpful and upheld exceptional service while the demonstration went on. Overall A+ experience! We will be back again! From the very beginning the experience was so much fun. Entering the Rolling Pin we were welcomed with the great kitchen store. Staff was friendly and helpful. Tatiana's presentation was excellent! She is down to earth and obviously excited about her cooking and talented. The food was delicious! I came in thinking we would just be sampling just a bit and was treated to a huge meal. I'm sure I will be back and definitely recommend to others. Thank you. Tatiana was a great chef - excellent at cooking, demonstrating and teaching. Food was deliciouso! Wholly enjoyable experience. The class was very informative. The food was delicious! I can't wait to take these recipes home to try them. The chef was very entertaining and seemed like she loves what she does. I'm so glad that I was part of this experience tonight! Dinner was wonderful! I enjoyed participating. I love to cook and the food was delicious. Chef Todd was patient and easy to talk to . Great 1st experience. 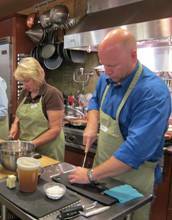 I recently attended the Real Men Wear Aprons class on July 14. It is refreshing to go out on a date night and have the men be responsible for the meal. Todd brings the 'Cool' back to cooking and reminds couples that part of speaking each others love languages is through preparation. Service and relaxed enjoyment of a good meal! There is no better place for a date night than Rolling Pin and we can't wait to check the calendar in order to book our next event! Thank you Chef Todd and Rolling Pin. I took my first class with Chef Barbara the other night and it won't be my last! What a wonderful job Chef Barbara did showing us step-by-step each dish she was preparing, and she was very good when she answered questions and made sure we understood what she was saying! The flavor of everything we were served was "Fantastic"!" I have been wanting to learn to the correct way to make macarons ever since I tried then in Paris at Laduree. Chef Barbara was an excellent teacher! I now feel confident to try to work them on my own. Great Class! Chard Ward's BBQ was very informative. He had good presentation skills, he made it easy to understand and the food was excellent. We will come back for more. I just attended Chad Ward's BBQ class and it was an amazing experience from beginning to end. Not only was every dish delicious, but the instruction was superb as well. I came in knowing very little about the world of BBQ, but that was completely changed. I'm ready for more! I just made the Cherry Vanilla Chicken a la Nielsen, from Chef Lynnette's Vanilla Class, for dinner last night and it was amazing!! I served it with orzo with a maple cinnamon butter sauce (used about 1/4 cup maple cinnamon sugar compound from the store, melted, added 2 tbs evoo and pepper to taste) with mint (fresh from my herb garden) infused water! Thanks, Chef Lynnette! Can't wait until the next class! Just attended Tatiana's Thai cooking class. I thought it was delicious, informative, great presentation, fun and a great opportunity to try new things. I just attending Chef Tatiana's Thai cooking class. OMG! Three of Tatiana's offerings are in the top 10 of the 50 Best Foods in the World and she hit a home run executing them all perfectly! If she offers this experience again, I will be the 1st to sign up! Todd's 50 Years Of Yum Class was entertaining and the food was great. I plan to try these recipes at home and return for future classes. Todd is awesome! Each time I take one of his classes I go home with great recipes, some Ybor City history and a smile on my face from a great time! I just had a great class with Chef Gui! He is a great teacher, very informative, great with questions and also entertaining. I've wanted to make "Floating Islands" since I had the dish in Paris, but it seemed too complex. Chef actually showed that it is quite simple. I thought that Chef Gui was professional, friendly and entertaining. This was our 1st cooking class and we thoroughly enjoyed ourselves! Very pleasant and the food was wonderful! Thank you! Chef Barb's Recipes From The Pumpkin Patch cooking class was really fun, informative, and entertaining. The food she prepared was delicious, and filling, and the recipes were explained in detail. I sure hope Barb will teach more classes in the future. Kudos to Barb! This was our first visit to the Rolling Pin Kitchen Emporium, but certainly not our last! We attended Chef Barbara's Recipes from the Pumpkin Patch and we left with some amazing ideas to wow our family for Thanksgiving. Can't wait for the next class and looking forward to being treated so nicely by the entire staff again. Thanks so much!" Chef Dave was very patient & knowledgeable in guiding us around his gourmet kitchen. He is so organized with having all the ingredients already measured & ready to go. The Rolling Pin store is loaded with every imaginable kitchen accessory. Thanks again. 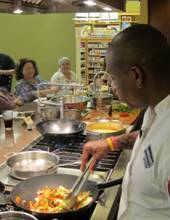 A very enjoyable class with�Chef Blake in a relaxed atmosphere in a state of the art kitchen for cooks at any cooking level. 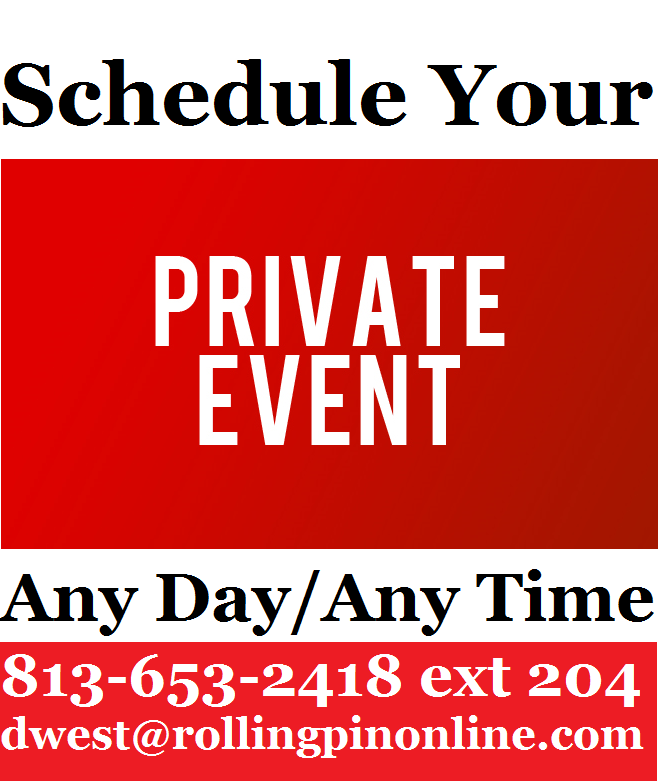 You will feel comfortable asking any questions at any time and get plenty to eat.� This was my first class and will definitely come back and recommend to anyone!� Great for a date night! Debbie K - I have really enjoyed the classes I have taken...lots of ideas.� I romance being a good cook! Absolutely incredible! The most amazing experience I have ever had involving food. It's like I was in Hell's Kitchen. It made me comfortable cooking and yet gave me more appreciation for what goes into the food I love. I highly recommend! A for sure Bucket List! Exceptional class - Todd is very personable and the concept is great. I like the way he encouraged us to jump right in. Look forward to the next class. Class was awesome! Learned and enjoyed everything that we observed! We will definitely be back. We thoroughly enjoyed our demonstration class. It was our first class and we really appreciated the relaxed atmosphere. We will definitely be back to do this again! Very practical. Can be very used for many events. The onion soup was outstanding � love the onions being caramelized because the sweetness pars so well with the cheese. Second favorite was the goat cheese mousse � an unsurpassed treat. Love potatoes, but never would have thought about adding balsamic vinegar. Apple tart was excellent. Barbara is an excellent teacher, easily conveying the ease with which you can prepare these recipes, while stressing the idea of �mise en place� to have everything organized before you begin. She gave us a lot of common sense tips which are very practical. Look forward to the next class! Good mix of cooking, tips and family history. Food was delicious! I very much enjoyed watching and listening to Todd. He is a seven generation native to Tampa and is full of local ideas, flavors and stories. Not only did he share the history, but he included his own personal touches and shortcuts. The class was fun, educational and delicious. Chef Daniel was very personable and very knowledgeable. I thoroughly enjoyed this demonstration. I learned a lot and the food was absolutely delicious!!! I liked all the extra side notes he provide to us. He introduced food items to us this evening that I never experienced before and made me feel that I can pull these dishes off at home. I can't wait to try the Gnocchi & Rock Shrimp dish as soon as possible and the Speck Wrapped Pork Loin is going to be our Christmas Dinner this year. Great Food & Great Chef! Cinco de Mayo at Rolling Pin = Muy Bueno! The drinks were flowing and the food was amazing. Chef Barbara was very engaging and made everyone want to get involved. I had never been to a Chef Anthony class, but I knew my husband would enjoy a Spanish meal. We loved this class! Not only did we have delicious food, but er also had a historical Ybor City tutorial! Super delicious, easy menu and a super personable chef! Thank you. Educational, Fun and Entertaining!!! 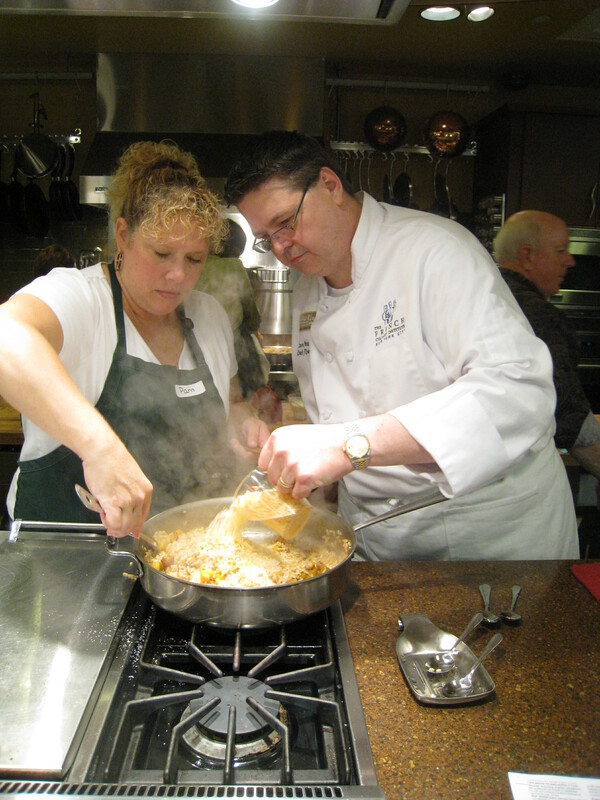 Chef Dave and Chef Barbara are both a joy to listen to and make food fun! Micheal's knowledge of wine is simply the best, we enjoy his explanations of each wine with the food! We will be here every month, love it!! fun class as usual, I had always thought making pasta was much more difficult than it is- I can do this!! and ,OHMG the burnt butter and fresh sage yum, yum. Excellent. We had a lot of fun and learned something at the same time!. The chef was engaging and encouraging. Loved the set up and everything was so organized. The staff was friendly, helpful and courteous. The shop is amazing. There's something for everyone. Topping the class off with lunch from what was prepared with a nice glass of wine was a great way to sit back and enjoy the food and a relaxing way to end the day. Will definitely sign up for more classes. As Bob Beall said, "you took this party to a new level". You and your wonderful crew made this evening magical. The compliments about the smells, flavors, presentation and menu were flowing as freely as the wine! I loved the way you introduced each course with your down to earth southern charm and wit. Randy and I have enjoyed getting to know you this past couple of years. Thank you for making these milestone events in our lives so incredibly memorable. Kudos! Todd Lopez is a delight and his food is the ultimate in Spanish comfort food. Yummy and very doable for the home cook. Bring him back. Thanks for a great evening. Mission accomplished! Food delivered and stored at the Ronald McDonald House for tomorrow's dinner. Once again a great big thanks Chef Dave for making it happen. It far surpassed everyone's expectations. Terrie and I had a blast!! I used the class as a date night! Terrie did not know where we were going or what we were doing. She was very pleased and enjoyed it immensely! I was impressed with the overall experience and liked the attention we received from the "volunteers". My drink never got dry (Big points!). Choices of beverage were great! I found Dave to be a pleasant expert that took the time to explain each step. His knowledge of the subject is wonderful and his technique was flawless. Having the recipes already typed and ready, eliminated a lot of wasted "question time" that might have occurred otherwise. I appreciated that Dave made good suggestions of local groceries that he knew from his own experience. That is useful to the newbies and the seasoned sushi makers alike. In short we had a great time, enjoyed drinks and dinner, learned skills and made new friends in a wonderful environment. Old Charleston is now on my to do list. Wonderful food!-- and now the northern gal will be making GRITS--ta dah. Thanks Dave for a great evening, I learn so much every session. Hi, last night my friend, Kelly, and I attended chef Dave's dinner demonstration. I love watching good cooking shows, but this was everything that's missing! There was socialization, and we got to eat the wonderful creations! I'm going to be a regular! Thank you so much for offering these classes! Now if I can find a cooking school cruise... :) Again, thank you so much for such a lovely evening! What a lovely time we had making sauces. Thank you for such a pleasant, informative, and tasty gathering. The Cookie Decorating Class was my first class at the Rolling Pin. Loved it! Chef Barbara was excellent. She was well prepared and offered many tips and hints along the way. And while this was a cookie 'decorating' class, Chef Barbara even prepared the shortbread cookie recipe at the beginning of the class and cut out a few cookies. Nice extra. Thanks for an excellent class and wonderful timing for preparing my own decorated cookies for the holidays. What an honor to see two great chefs, Chef Dave and Chef Blake at work during the Iron Chef Winter Squash Competition. It was a pleasure to see and taste the excellent dishes and I would like to be a participant in the competition at some point. 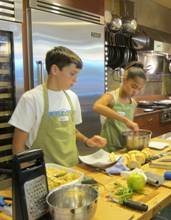 I can't wait to look at the schedule of cooking classes and sign up for another event!